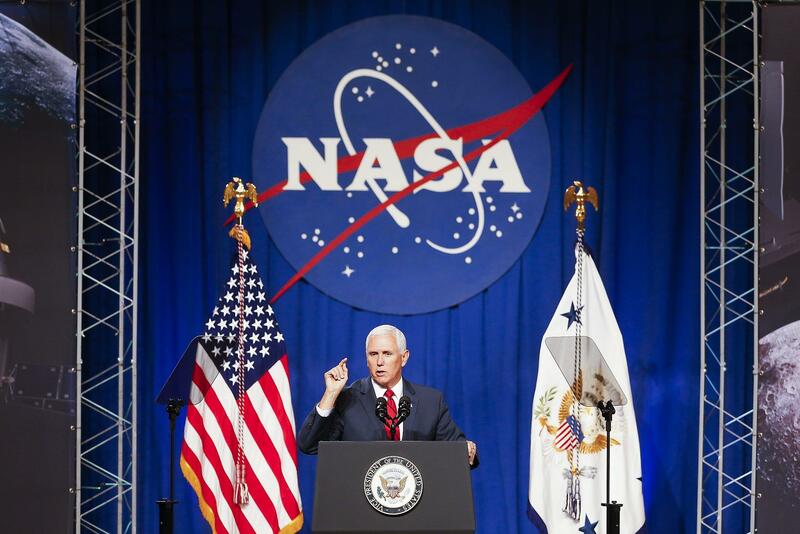 WASHINGTON, March 26 (Xinhua) -- U.S. Vice President Mike Pence on Tuesday announced a plan to return American astronauts to the moon within five years, warning that if NASA cannot do it, it is NASA, not the mission, that must change. It is "the stated policy of this administration" to return American astronauts to the moon "within the next five years," said Pence at a meeting of the National Space Council, which he chairs. Pence called for a "major course correction" for NASA and reigniting a "spark of urgency," pointing out it was in the 1960s when the United States became the first nation to reach the moon. Pence said that the first woman and the next man on the moon will both be American, and that they will land at the lunar South Pole which has "great scientific, economic, and strategic value." He criticized the delay of NASA's new-generation heavy lift rocket, saying it is being plagued by "bureaucratic inertia." Pence recommended the use of commercial launch systems instead. "If American industry can provide critical commercial services without government development, then we'll buy them," said Pence. Pence also threatened to "change the organization, not the mission" if NASA is not capable of landing American astronauts to the moon within five years.